In 2006, Lincoln Hall summated Mount Everest. It was almost the last thing he did. Descending from the summit, Hall suffered a bout with altitude sickness. Cerebral Edema is very deadly, and many die from its effects. At that altitude, it is difficult to rescue someone who is dead weight. Unable to continue down the mountain, he was left for dead above 8000 meters. During that night efforts were made to rescue Hall, but rescuers were forced to turn back due to darkness, lack of bottled oxygen, and snow-blindness. However, the next morning he was found alive and lucid. Still in danger, he was taken down the mountain, being able to move on his own. Later he would make a full recovery. The controversial death of David Sharp not long before Hall’s rescue is a dark shadow over the 2006 Everest climbing season. It has been pointed out that while Hall was able to assist with his own rescue, Sharp was conscious but largely unresponsive. The controversy is over the fact that almost forty people passed by David Sharp and no one abandoned their summit quest to help the stricken climber. After all, the people who ended up rescuing Lincoln Hall abandoned their summit bid to help him down the mountain. Had someone done that for Sharp, would it have saved him? Nobody will ever know. 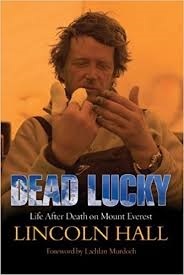 The story is told by the one person who knew what it was like to be left for dead and have to survive above 8000 meters for 12 hours, Lincoln Hall himself. He details his thoughts, his suffering, and his gratitude at surviving. He tells his readers what drives a man to climb, risking everything to stand atop the highest mountains. Through it all, he holds the reader spellbound.